Amer Fort or Amber is an iconic tourist attraction in Jaipur. It is reminiscent of the grandeur of a bygone era. Its presence is hard to ignore as the architecture of Amer Fort is captivating. What makes Amer Fort so popular among tourists and travelers? This Jaipur travel blog takes a closer look. Ghati Gate demarcates the Kanak Ghati & Amer Ghati. 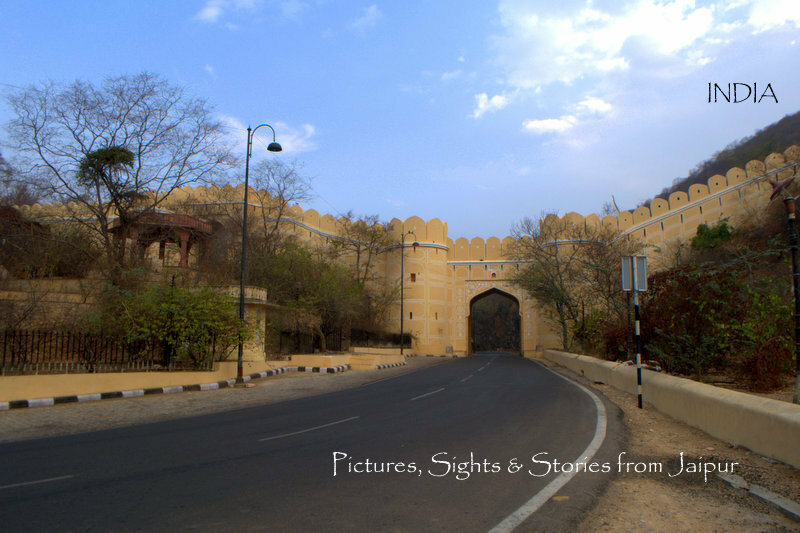 Once you pass through Ghati Gate, Amer Fort is another 4 minutes drive. Once you cross the Ghati gate you enter the narrow Amer valley with hills on either side. The road meanders through with the gentle turns until you reach the Maota lake. It is here that you get an expansive view of the Amer valley with the majestic Amer Fort and the towering Jaigarh Fort just above. In my opinion, here are 5 reasons why I love Amber Fort, the most popular tourist attraction in Jaipur. Elephant ride at the Amber Fort is one of the most sought after experience. It’s not uncommon to find long queues of tourists during the peak tourist season waiting for their turn for the elephant ride. There are very few places in India where one can undertake an elephant ride; the one at the Amer Fort is easily one of the most convenient & easy of all. There are many tourists who prefer not to undertake an elephant ride at Amber Fort because they are against the animal cruelty. Some organizations have demanded halting elephant rides at the Amber fort citing the same reasons. The decision is yet to be arrived at. Elephant ride at the Amber Fort is one of its kind experience. The pastel Ochre color looks stunning when the soft sunlight strikes the walls of the Amer Fort. It looks fabulous & Magical. Ochre color is quite unique and there aren’t many heritage palaces, forts & buildings which sport this mystic shade in India. Even though Jaipur is famous as the Pink City, the buildings and Havelis in the by-lanes of the old city of Jaipur were painted in Ochre color. Have a look at these pictures of the Amer Fort. Amer Fort looks majestic in Ochre color. Amer Fort is one of the UNESCO World Heritage sites in India, which speaks a lot about this place. Very few forts in India have made it to this list. Amer Fort is classified under “Hill forts of Rajasthan” along with the forts at Ranthambore, Kumbhalgarh, Jaiselmer, Chittorgarh and Gagaron. Sheesh Mahal is synonymous with the Amer Palace. Sheesh Mahal refers to a section inside the Amer fort where walls and ceilings are embellished with the concave shaped mirror in the form of inlay work. It requires a great skill and workmanship to create such a stunning piece of art. Amer fort architecture features a unique combination of Rajput and Mughal architectural styles. Its a fine specimen of two different architectural styles. Mughal architecture needs no introduction; world-famous Taj Mahal is one its finest examples. The entire setting of the Amer Fort with its surroundings is beautiful. Where else can you witness the grandeur of Maharajas? For many people, the first look of Amer Fort is nothing less than a fairyland with elephants moving in a line, ferrying tourists through the ramp that leads to the palace. Amer Fort with the Mughal style garden. A panorama shot of the Amer town and the surroundings. Expansive view of the Amer Fort along with the Maota lake. Beautiful Amer Fort complex as seen from a different angle. In short, Amber Fort has a mysterious charm which attracts many tourists visiting Jaipur. Amber Fort was abandoned at the start of the 18th century. Some years ago, the fort was renovated beautifully, giving it a new life. It is still visited by the locals, not as a tourist, though. Devotees throng the ever popular Shila Mata temple inside the Amer Fort. During Navaratras, thousands of devotees visit this temple for Darshan due to which Elephant ride at Amer remains suspended. The beauty of Amer Fort can neither be described in words nor by pictures. You’ve got to experience it in person. Have you been “Amber’ed”? Pigeons with the Amer Fort in the background. Amer Fort is open from 8 AM- 5 PM and is part of night tourism programme. Amer Fort can be visited between 7 PM to 10 PM. Your blog is a really a guide to Jaipur. Me and my colleagues have planned a trip to Jaipur but we didn’t know where to start. Now that I have read your blog, we can plan our trip easily. Pingback: Jagat Shiromani Temple – Jaipur Thru My Lens !! Yes, I have been “Amber’ed”. 🙂 Arv, your post took me years back when I visited Amber Fort. It was such an amazing experience with many tourists – local, national and international, all wowed by the stunning beauty of the fort. I remember that time too the elephant ride was in huge demand and there used to be a long queue for the same. We were not interested in the elephant ride and rather walked our way to the Fort. Sarmistha, Amer Fort (well it actually is a palace) is a unique experience. It is taking a peek into the lives of royalty. Yes, it’s popular among all travelers and tourists. Personally, I don’t ride any animal so I stay away from elephant ride, but it is one of the biggest attractions at Amer among the overseas tourists. Where else can you ride an elephant so easily? I love walking up the fort. There’s something nice about it. 😃 Did you visit many years ago? Previous Previous post: Why You Must Explore Traditional Bazar In Jaipur?